This has been an exceptionally long week for us. EJ and I have been exhausted. I’m not sure why because it’s not unpleasant sitting with JJ at the Cancer Center. It could be that the constant drives to the Cancer Center, the bad weather, the vehicle problems, and JJ feeling so bad this week is all taking its toll on us. We got home early enough on Wednesday that EJ was able to rest a bit before he had to leave for work. I got my evening chores done, and then JJ was hungry for Chubby’s food so I called in his order. Usually I go pick up the food, but last night I asked them to deliver because it was dark and cold and we were tired. JJ fell asleep about 8 p.m. Since he was feeling worse as the week went on and I didn’t know if he’d need me during the night, I threw another log on the fire and lay down to sleep too. I woke when EJ got home from work at 11 p.m. and we talked for a couple of minutes, but then he went upstairs to bed and I fell back to sleep. I woke again when my phone alarm went off at 3:30 a.m.to remind me to give JJ his anti-nausea medicine. I threw more wood on the fire and went back to sleep. I woke Thursday morning at almost 8 a.m. I had had almost 12 hours of sleep! But despite the hours of sleep, I spent Thursday in a fog of fatigue. When we arrived home, our neighbor called out to EJ as we got out of the truck. They had a pot of very delicious homemade chicken soup for us. Other friends left a bag with a blanket, books, and a Chubby’s Cafe gift certificate. These loving gifts were very appreciated gifts at the end of a long, tiring day. I was too tired to write last night after we got home. I couldn’t put two thoughts together. This morning JJ felt very nauseous. He had his primary anti-nausea medication at 3:30 a.m., and his second one about 8:30 a.m., but he still fought nausea all the way to the Cancer Center. As soon as he got settled in his Infusion Chair, JJ told the nurse he was nauseous…and then that he felt he was going to be sick. She got him a dish and he heaved a few times. Then she quickly injected his anti-nausea into his IV. After a bit, it helped enough that he could put aside the dish and fall asleep. However, he continued to struggle with nausea throughout the day. His oncology nurse talked to the doctor’s nurse, who gave him a prescription for a third anti-nausea med. He will take the third one if the first two aren’t sufficient. Poor guy. This is his most difficult week so far. Most of the time we do not have roommates at the Cancer Center, but when we get a roommate, they are usually there for only a few minutes or a couple of hours. 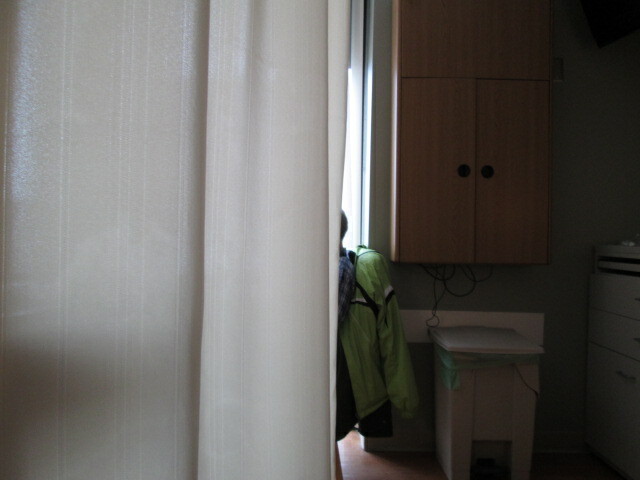 We are always the first in the room and when a roommate is about to come in, the medical staff always closes the curtain dividing the room to give privacy to each family. When the roommates arrive, we try to assess whether they are less talkative or more talkative so we know whether to chat or give them space. Even the least talkative have always acknowledged us with a friendly nod, a smile, and a “hello,” so there is a certain friendliness even if they don’t talk much. We can always tell when the roommates want to chat because there is a warmth and curiosity in their eyes. They tend to ask how old JJ is–and the conversations go from there. Once we begin to converse, we always shove the dividing curtain back and share life stories and encouragement. Friendly people make the day go faster. They become friends and we always greet each other warmly whenever we meet. Yesterday we had roommates for the last couple hours of our day. The husband had a form of cancer that over the last 18 years has popped up in various lymph nodes in his body. I think it’s called lymphoma. His wife was with him, and she immediately began chatting so we pushed the curtain back to fully interact with them. As we chatted back and forth, we found out that they live in the same area where EJ grew up. The man remembers EJ’s father at work and EJ knew their close friend. We heard about their awesome vacation to Alaska a few years ago. We learned that their son was 39 years old when he died of cancer in 2001, and they raised that son’s child as their own. When the wife teared up at the mention of her son, she and I hugged. As we were all preparing to leave for the day, the woman said to JJ, “I am a hugger. Do you mind if I give you a hug?” and she gave JJ and big, warm grandmothery hug. They were awesome. When people are friendly like this, it feels as if we are all together in this battle, a family of support and encouragement. With the curtain closed, this was the view from my chair all day. Today we had roommates for the whole day who felt unfriendly rather than simply quiet and reserved. They did not acknowledge EJ’s friendly greeting (I was hidden behind the curtain so they couldn’t see me). The only words they spoke to us all day was to insist we hit the call button to summon the nurse as soon as JJ’s machine started beeping as they were settling into the room. The nurses are very quick to respond to beepings, so we always simply wait for them to come rather than “summon” them. Even though the dividing curtain between our areas of the room was closed, the man accompanying his wife tugged the curtain to make sure it was completely closed and he turned his chair away from us. We tried to “judge them favorably” and on the way home speculated, “Maybe they are EXTREMELY private people. Maybe they had an awful week. Maybe they are very tired. Maybe…. ?” Everyone has a story and it’s difficult to know what theirs was. But it didn’t feel comfortable in the room today, every glance or interaction or word felt like a disruptive intrusion on their privacy, and their unfriendliness felt like a tangible presence that sucked the joy out of the friendly, supportive atmosphere of the Cancer Center and made the day an ordeal. Today’s chemo felt more silent and lonely and the day longer and more stressful than we’ve ever experienced. It was a difficult ending to a difficult week. I really hope we have friendlier roommates in the future. The brightest spot in the day was my conversation with Chris, the awesome Patient Care Tech. His joy counteracted the joylessness of our roommates. At the end of the day, EJ always leaves with our luggage and gets the truck started and warmed while I help JJ get ready to leave. JJ always goes to the restroom before he gets his coat on. While he was in the restroom today, Chris paused in the doorway, “Is JJ ok?” he asked with concern. I explained that this has been a tough week for JJ and he hasn’t felt very well. Chris said that the third cycle of Chemo always seems really hard for people. He said that it’s really hard for him to see JJ feeling poorly because he is so young–he is one of the youngest patients they’ve ever had in the Cancer Center. I said that we are glad that JJ wasn’t in the pediatric ward because it would have been heartbreaking to be among suffering little children. Chris said that’s why he works with adults instead of children. He couldn’t have endured seeing the children suffer. Chris said he really loves his job and he really hates it. He hates that people are ill and that the chemo makes them so sick. However, his own parents died of cancer so he loves to treat patients and their families with as much love and care as if they were his own family. I told him he was awesome at his job. “You are a bright spot in this whole cancer experience. You make it easier to get through this,” I told him. He thanked me, and said that “Nice people like you make my work a joy.” He added honestly, “I do get some cranky patients sometimes.” I am glad we are “nice people” and not cranky or joy-sucking people. “Double J” felt nauseous and sat with a vomit bag on his lap all the way home. He’s been waiting all week to have Chinese food, and he was determined to get it, so I ordered ahead and we stopped and picked it up on our way home. At home he nibbled it a bit and then shoved it away to save for later. He curled up on the couch and fell asleep. This weekend we are expecting another snowstorm to hit. I’ve heard we could get more than six inches of additional snow. But my family plans to stay home, with no place to go, and rest.